The electrical sockets used in Australia are type I. 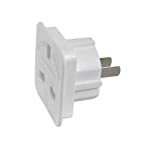 You will therefore need a UK 3 pin to type I adaptor in order to plug in your appliances. 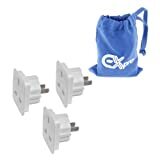 Voltage - The mains voltage in Australia is 230 V which is compatible with all UK appliances (UK voltage is currently specified as 230 V +10% / - 6%). Frequency - The frequency in Australia is 50 Hz which is the same as the UK. Special considerations - As of 2000, the mains supply voltage specified in AS 60038 is 230 V with a tolerance of +10% -6%. This was done for voltage harmonization - however 240 V is within tolerance and is commonly found. Mains voltage is still popularly referred to as being "two-forty volts". Bathrooms in hotels will often have a type I, C and A socket marked "for shavers only".